Matt Sen insists he is ready for the step up to eight rounds, and a title tilt, in only his fourth professional fight. The likeable Sen, a former body builder, takes on Wolverhampton’s Joshua Burke in a Black Country battle for the British Challenge Cruiserweight Title at the top of tonight’s bill. 30 year-old Sen, who made his professional debut 12 months ago, is in confident mood ahead of the clash. “Camp has gone great,” he told bcb-promotions.com. “There has been lots of learning and working on my flaws. “We have mixed up sparring this time with some in house technical sparring and open spars with Ricky Summers and some of the UFC team. “Fighting in an eight rounder is a big step, let alone challenging for a title. For me it is really exciting. It’s a challenge and I like to continuously keep pushing myself. Sen has studied Burke in the build up to Saturday but has left the game plan in the hands of his trainer and mentor, Peter Christie. “I’ve been watching Josh since last year when there were first talks about us fighting. I feel like I know him better after constantly studying him. I’ve been looking at his habits and how to capitalise on them. Josh is a big strong guy who I won’t be taking lightly but I will be coming home with a win. “I am leaving the game plan completely in Pete’s hands. 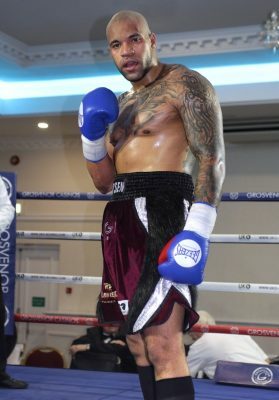 I trust him with everything so I just turn up and do as I’m told and with his approach I know I will be ready. .
Welborn vs. Langford II on Matchroom Birmingham Boxing Bonanza!